It’s easy when you watch a time travel movie to picture how you might use this technology in your own unique way to benefit yourself, and how you would skirt the hazards encountered by the folks onscreen. In Time Lapse, the new sci-fi movie from director Bradley King, three friends stumble across a camera that takes photos 24 hours into the future, and they attempt to pull this off, not faring much better than those who came before them. This movie falls in the same general category as Colin Trevorrow’s Safety Not Guaranteed, a low-budget genre flick with more ideas than money that popped up at film festivals, and there’s nothing wrong with that. Finn (Matt O’Leary from Spy Kids, all grown up now) is a starving artist, frustrated by his lack of success, who dreams of more than working as a glorified toilet repairman managing an apartment complex. He lives with his girlfriend Callie (Danielle Panabaker, The Flash), whom he spends most of his time not appreciating—she mothers him, putting up a front of her own—and his compulsive gambler best bro Jasper (George Finn). When they check in on an elderly neighbor (John Rhys-Davies, who only shows up onscreen in photos), they find his body and a massive camera aimed at their apartment that takes snapshots of the future. They don’t call the police or authorities—because why would they?—and the friends rationalize utilizing the massive contraption for their own greedy ends. Jasper uses this window to tomorrow to get the winners of the dog races he gambles on, while Finn copies the completed paintings that show up in the photos every day. Everything is great at first, but if you suspect they don’t stay that way forever, gold star for you. Before too awfully long, the camera starts spitting out images of unpleasant events that cause the once tight crew to go for each other’s throats, and things spiral quickly out of control. While all of this happens, Time Lapse allows these events to unravel at a deliberate, measured pace, letting the conflict stew and bubble. Initially, the benefits outweigh the down side, the trio can cope, but the tension in King and co-writer BP Cooper’s script gradually ratchets up. They’re meticulous in turning the screws, dropping hints, laying the groundwork, letting the characters simmer until they’re pushed to the point where they can’t help but boil over. A relatively contained three-hander, the main leads all deliver strong performances that are engaging and add to the tension. They feel like real friends and share a legitimate bond, which accentuates the layers of tension that develop over time. Finn, Callie and Jasper have a fluid dynamic, with allegiances morphing and shifting along with changing circumstances, reveals and deteriorating mental states. They have an extensive, complex history, and they all come with their own baggage and secrets that come to light in natural, satisfying ways. You connect with them and wonder how, and care if, they’re going to extricate themselves from their problematic situation. You can’t help but notice notes of Hitchcock and De Palma throughout Time Lapse. These obvious influences show up in the direction, the contained setting, and the unspooling conflict. There’s even an eerie string score reminiscent of Bernard Hermann, Hitchcock’s primary composer, which drives this home. But while there are definite points of inspiration, Time Lapse still manages to do its own thing. Beats of dark, gallows humor add breaths of levity for a moment, assuaging the tension a second here and there, while it increases the pressure elsewhere. It all comes together to keep you on the proverbial edge of your seat. Limited in scope and scale, Time Lapse uses these boundaries and restrictions to great effect. The world never extends beyond the courtyard of their dumpy apartments—you do look out a few times, but it’s through a wrought iron gate that brings to mind the bars on a prison window, only enhancing the feeling that you, and the characters, are trapped by their fate and time. Outside comes to represent escape and freedom, but whether or not they can achieve this, or want to, you’re not sure. There are a few questionable jumps of logic in the plot. The characters accept the general premise without any questions, and there are times you might have cause scratch your head and wonder, but in general these instances are minor bumps in the road. All in all, it feels like an extended, well-executed episode of Twilight Zone. 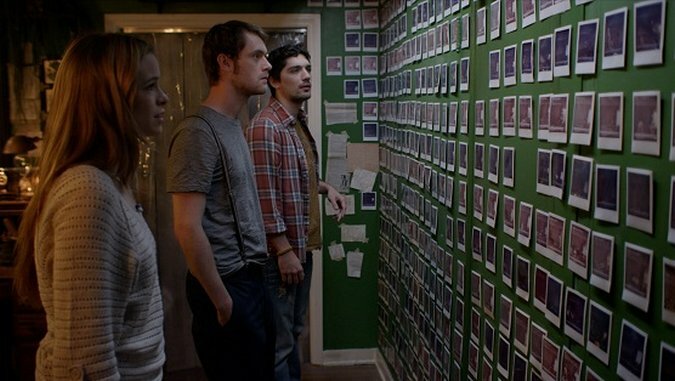 Time Lapse is a taut, modest sci-fi thriller that makes the most of what it has to work with, creating something greater than the sum of its parts. The story is quick but never rushes over its 104-minute run time. A second viewing will reveal the trail of clues that King and Cooper sprinkle to mark their trail, but as these hints unravel they come as surprises. It may not reach the highs of the films mentioned earlier, but Time Lapse is definitely one to check out, imparting an important lesson: Don’t mess with time.